Ever since I was born, I have been living on a meatless diet and have therefore automatically been exposed to numerous sensitive conversations about being a vegetarian. For 25 years, I have had to experience many debates, discussions, fights, insults and criticism about the way I nourish myself, even though I have felt and still feel that I am doing the right thing, but I never found a convincing way to change people’s minds on the issue. In the following, I will explain why vegetarianism is the right thing to do and what wide ranging effects meatism aka carnism has on our world system. The most important thing to me, is to identify a nonviolent way in communicating with third parties about this very topic, without offending other people in their way of thinking. Besides the fact that vegetarianism is my chosen & natural lifestyle, there are a number of ethical, moral, environmental and emotional reasons why I cannot imagine myself having a different attitude towards eating meat. All of the above angles have one negative common denominator: violence. (1) I will identify direct and hidden violence with the help of Johan Galtung’s faultlines in order to assess just how much violence is linked to eating meat and how much of it is actually cultural & structural – meaning: very much hidden in the way we take for granted how we interact with animals. Galtung applies faultlines as an analytical instrument in order to identify social conflicts & contradictions in any given society. (2) Looking at his list of faultlines, the first one, namely nature & environment, refers us to speciesism and addresses the power relations between humans and the rest of nature. Eating meat implies very obviously an act of violence, which is the killing of animals and therefore can be identified as direct violence. Direct violence means that you can name subject, object and the executed action (i.e: the slaughterer kills the cow). In this faultline there is not only direct violence to be found but also structural violence apparent as the artificial creation of life or so called stockbreeding. Often, animals are only being created in order for them to die and then be eaten by us humans. The way animals in large-scale animal husbandries are being held, the way they are being treated and fed and the way they are being killed is morally reprehensible. In Germany alone, 753 Million animals are so called ‘farmed’ for the food industry per year. (3) At the end of the day, it’s only for the purpose of becoming cheap and ultimately unhealthy food for humans. (4) Clearly, humans put their own species above animals and therefore accept creating and upending animal life for expediency while in comparison, the discussion about human cloning as well as abortion is a quite sensitive issue. The English concept of ‘livestock’ as well as the German word ‘Nutztier’ indicates the process of objectifying the living being. This said, I criticise that this is not only violence against nature in terms of the destruction of land, plants or animals but also against the human condition. Simply put: While most of our farmed land in this world is used to feed animals, there is still not enough water and food for every human being available. (6) According to the FAO report on world hunger in 2015, more than 795 Mio people still suffer from hunger and malnutrition. (7) The Albert-Schweitzer-Foundation quotes a study of the University Minnesota, claiming that by using the harvest of grains and soy products for human food instead of animal food, more than 4 billion people could be nourished. (8) Therefore meat production not only has dangerous impacts on nature but also on human livelihood. Having said this, the conflict is also unfolding in a further social faultline, which is class in terms of power relations between powerful and powerless humans. (9) It becomes a class issue when one observes how hunger mainly exists in the so-called developing, non- & semi-industrialised countries or continents, as opposed to the industrialized parts of the world, where buying meat in a supermarket is the most normal thing on the shopping list. (10) Johan Galtung splits the class faultline into four sectors of societal power: political, cultural, military and economic power. In this perspective, meat used to satisfy more elitist classes, where people not only had the economic power to purchase meat, but also the political power which made sure, that the distribution occurred according to the designs of those on top of the hierarchy whilst the executive branch’s power protects this system of meat production, distribution and consumption. Since this distribution includes the world system and can be seen in regional divisions, cultural power and power relations become visible across the globe for those who care or dare to look closer at the class faultline. Doing so unveals two more conflicts: 1-dominant nations versus dominated nations, which also makes it applicable to 2-the territorial & the centre-periphery faultline. Industrialized countries with access to all sorts and forms of meat form a de facto centre, while countries or regions without such regular access are at the periphery in this issue, even though they are often included in some way, say by working for the animal food production industry be it on the African or South American continent. 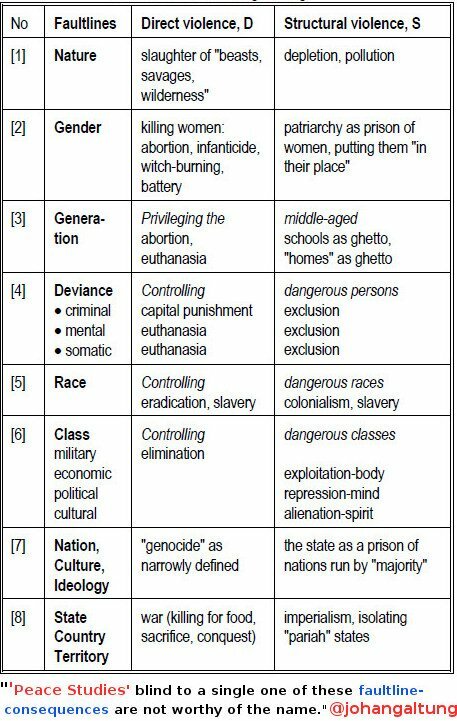 So far, the four identified conflict-formations according to Galtung’s faultlines all come with structural violence. The production and consumption of animal products causes not only harm to the environment, but also strengthens the unequal power relations within the interstate system and consolidates exploitation, hunger and ultimately complacency towards avoidable deaths of sentient beings – both human and non human. Those facts not only point towards a breach with our inalienable Human Rights but also with the International Covenant on Economic, Social and Cultural Rights which specifically points out in Article 11 (2), that governments have to take actions to “ensure an equitable distribution of world food supplies in relation to need” to guarantee the right to be free from hunger. 164 countries have ratified that agreement. Thus, eating meat has far ranging impacts, yet main arguments and conversations about vegetarianism only circle around the killing act exacted on animals. As shown in many studies from important and reputable organizations, it is far more than that. But once again the problem about structural violence is this: that the violence is not obvious, but hidden in structures and exploitative relations to the ecosystem which have become accepted as self-evident. I thought the above were reasons sufficient for people to become vegetarian. Well, at least that’s what one could reasonably assume after considering all those facts which are publicly available if not well known. Clearly, despite these quite convincing facts, it is just not socially acceptable quite yet for folks to forgo the industrial production, killing and eating of meats. If nothing changes, the majority of people who can afford it, will continue to enjoy a cheap piece of something sentient, the origin of which they are perfectly ignorant about, let alone cognizant about who killed it and how it got killed or how many litres of water were needed for the production process from breeding to slaughter. The question at stake is the following: why is this still normal and how may I contribute to changing this kind of thinking? In my research, I also came across an international organization called Beyond Carnism that has introduced the concept of “carnism” by the social psychologist Melany Joy who answers the above question by explaining how it is “a psychological fact: the perception of animal products as food is highly cultural.”(14) Joy explains that people eat meat is as a result of ideological conditioning. Both researchers therefore argue, that our actions and non-actions are created through our cultural value systems. To change eating habits would mean to change cultural values and belief systems. My second question about how to change those habits proved to be the more difficult one. A few years ago, when people asked the reasons for my diet, I used to tell them all of what I have just stated above. Equipped with such explanations, I became an activist with the goal to stop people from eating meat by discouraging or judging them as humans with bad habits. With this approach, when successful, I actually made people around me feel guilty, offended and sometimes just the explicit rejection of meat during a shared meal made people very uncomfortable. Considering that this would be an insult to their cultural belief system, which has been conditioned over their life times, it seems pretty understandable. Let’s face it: I barely convinced anybody to change his or her eating habits. But my point of not consuming meat is to avoid all this violence and live according to the Buddhist principle of Ahimsa – nonviolence. Imposing my insights and my lifestyle onto other people can also be a form of structural violence (the operationalizability of which I have been working on for over a year now – see the recent working paper here: Strukturelle Gewalt verstehen). I don’t like the feeling nor the thought of being a purveyor of structural violence in my surroundings, so I asked myself how one may advocate for vegetarianism while at the same time making sure one does not increase the total amount of violence by making people feel uneasy, queasy, offended or alienated by the means of persuasion employed. I have found something very important in my last 25 years of vegetarianism which features prominently in Johan Galtung’s approach to peace practice: applied empathy.